Nothing says New Orleans quite like great Oysters. They are a delicacy that seems to permeate every street in New Orleans, but very few get them right quite like the Acme Oyster House on Iberville Street does. They have a clear passion for the work that they do, and are very proud of the history of their restaurant which dates back to 1910. Each surface of the Acme Oyster House has a story, and if you ask the right person, you can get a full history lesson. The environment provided by the good folks over at Acme Oyster House is unlike any other. If you decide to head on over to Acme Oyster House, we suggest that you get started with the Boo Fries, which is fries covered in roast beef gravy and cheese, and order the Fried Peace Maker Po-Boy as your meal, which has been voted #4 in Top Ten Sandwiches, and for good reason! We strongly recommend this place immensely! 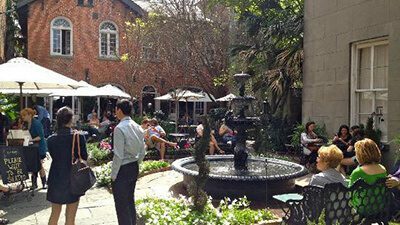 If you say that you've ever eaten anywhere half as beautiful as the courtyard at Cafe Amelie, then you are lying. There are few places that can parallel the atmosphere created by the Cafe Amelie. They are known for their remarkably beautiful courtyard, and they frequently host weddings, receptions, and private parties. Their menu is nothing to shake a stick at either. They serve delicious Brunch, Lunch, Dinner, and Desserts. Their Seared Ahi Tuna and Cochon De Lait Sandwich are some of their best menu items. Don't forget to check out their impressive and extensive Wine List, as well as their Beer Menu. 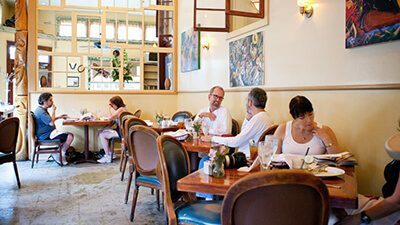 Cafe Amelie will make you feel like royalty. 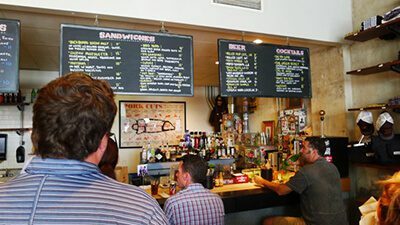 Hands down, Cochon Butcher is the most popular place to grab a bite to eat in New Orleans. It is incredibly hard to deny that fact, and its even hard to deny the fact that they deserve that honored distinction. They specialize in their sandwiches and wine bar. They specialize in house made meats, terrine, and sausages. All of their food is so fresh it'll make you faint. This is easily the fanciest butcher shop that you've ever been to ask well. We strongly recommend the Buckboard Bacon Melt or the Pastrami Sandwich on Rye. And as a side, you can't go wrong with the Marinated Brussels Sprouts or the Head Cheese with Chow-Chow and Mustard. 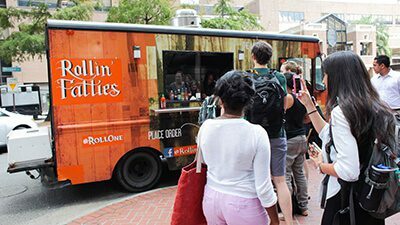 It might be unconventional to put a food truck on this list, but we would be ashamed of ourselves if we left Rollin Fatties out of this list. They have some of the best Mexican and Latin American food in the New Orleans area. And with their mobile location, you can keep track of wherever they're at via their social media accounts. They're so good that you'll want to get in your car and follow them around all day in order to try everything on the menu. Their tortilla chips are crispy, warm, and homemade, and their signature "Fatty" Burritos are where it's at! At Three Muses, they believe that there are three things that satisfy the soul of human beings, and that's music, food, and spirits. And at Three Muses, they get it more right than anyone else. 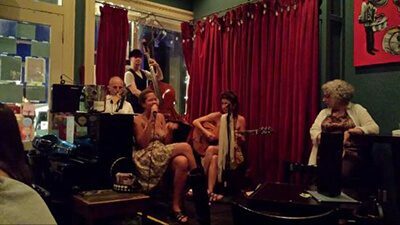 With the leadership of three people who are veterans in each of these fields, Three Muses provides a unique, and extremely well-rounded blend of music, food, and spirits. They have an expertly crafted menu that will be certain to blow you away, a remarkable and renowned list of specialty cocktails, and frequent live performances from some of the best jazz and soul musicians around. A meal at Three Muses is an unforgettable experience that will rejuvenate your soul, and will satisfy all of your palettes. As for food, we recommend the Tempura Shrimp, and wash it down with their specialty cocktail the Minor Swing Margarita. Delicious. The atmosphere in Atchalaya is more than enough reason to go, but in case the remarkable, historic, and charming setting that it provides isn't enough for you, then its eclectic, and expertly crafted menu will be. They provide exceptional contemporary creole cuisine, and service that will get your meal to you quicker than you can pronounce "Atchafalaya." They have excellent brunches as well, with live music and a bloody mary bar. Some of our favorite things to get here are the Brunch Burger, the Shrimp Burrito, and the crispy and warm Chicken-N-Biscuits. 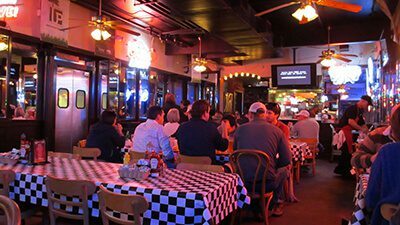 All of this, and the reasonably prices could make this place the hottest spot for you and your friends in all of New Orleans!